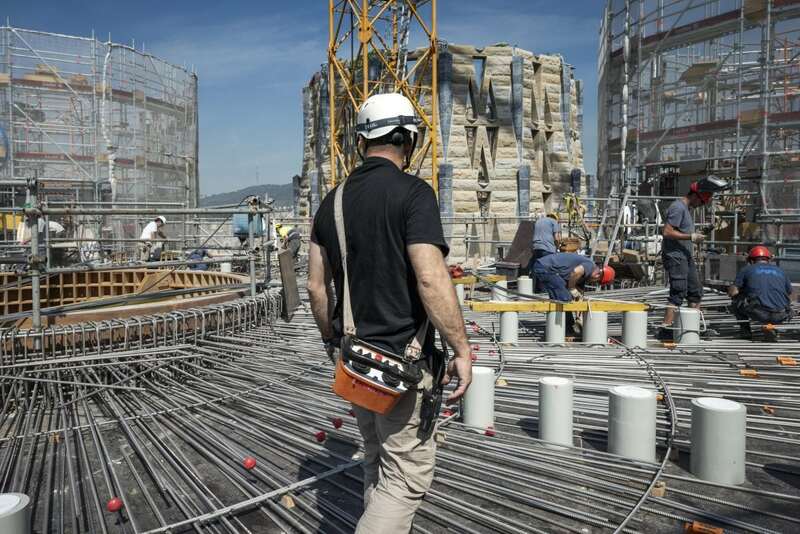 13 June is the feast day of Saint Anthony of Padua, the patron saint of construction. 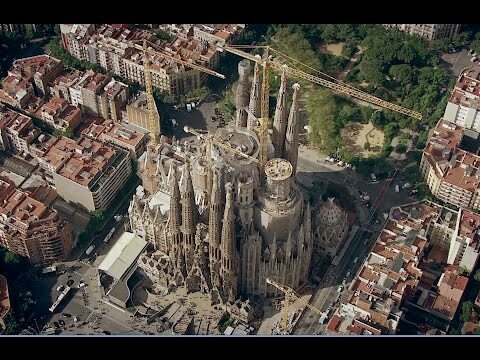 It is a holiday in this sector but at the Sagrada Família we observe it on the closest Monday, which this year is 18 June. 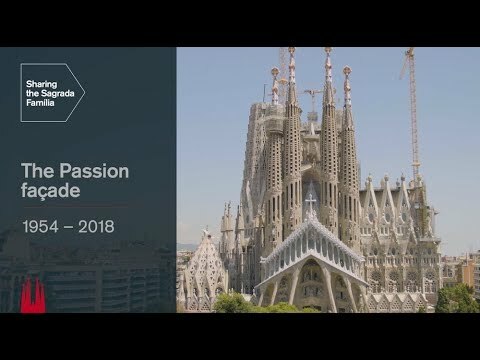 For this special day, we wanted to tell you about a typical day on the work site and how we are working to make Gaudí’s dream come true. To get everything going, one of the most important things is for the main crane to be working. That’s why the three crane operators and the general site managers arrive at least half an hour before the rest of their colleagues, at 7:30 am. It takes about 25 minutes to walk up to the top of the crane, as none of the cargo lifts are running at that time. 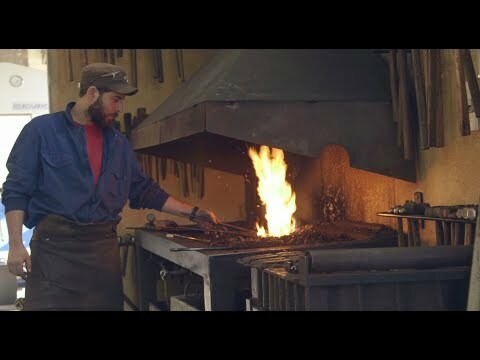 They start running at 8:00 am, when everyone else starts working, from bricklayers to the carpenters, blacksmiths, stonemasons and model makers. Some live in the neighbourhood, not far away. But others come from further afield, from Castellterçol, Manresa or even Berga, one hundred kilometres from Barcelona. The unavoidable traffic issues mean they have to get up early and leave home in good time. 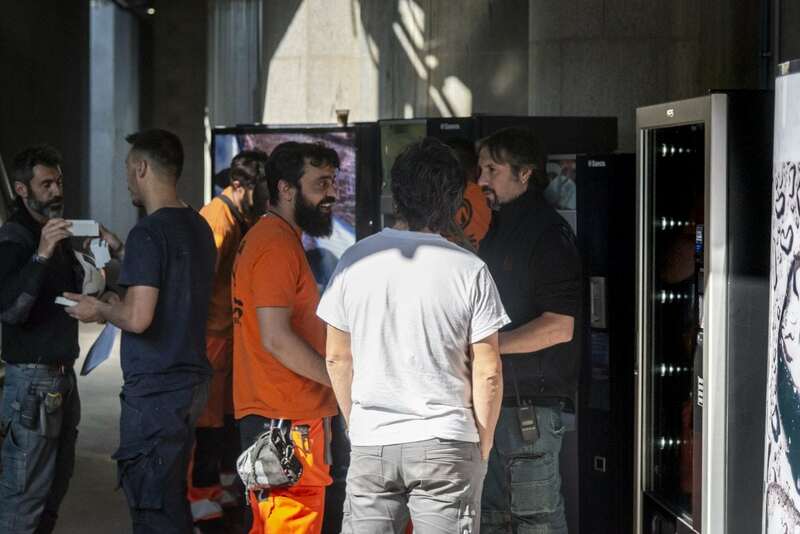 Some time ago, the Sagrada Família agreed with the Barcelona City Council to implement a series of measures to improve relations with those who live in the area, including the work timetable. So, for example, the site no longer uses whistles to mark the beginning and the end of the work day. 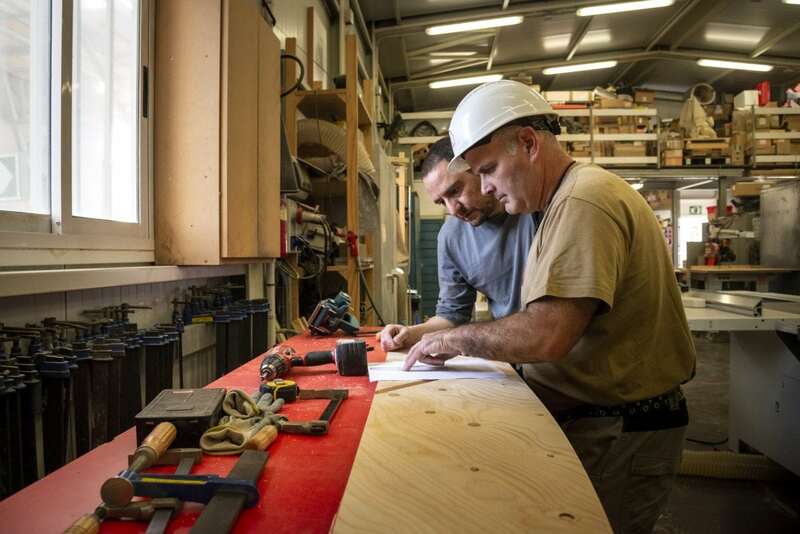 The hours in which the temple is open to the public require an important effort in terms of the work site, as they significantly limit the time available for working without visitors. There’s only one hour in the mornings, from 8 am to 9 am, and in the summer, one hour in the afternoons, from 8 pm to 9 pm, for complicated or risky manoeuvres that should be done when there are no visitors, while still respecting the agreed-upon hours so as to not disturb the neighbours. In the morning, the workers stop for a short 20-minute breakfast break. 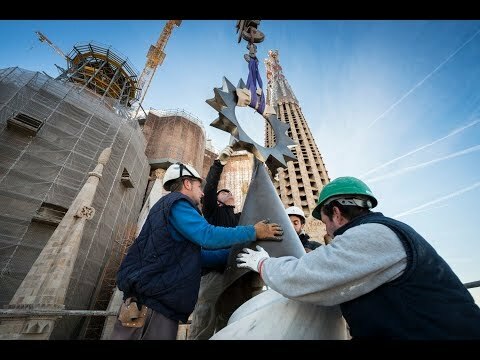 This is traditional in construction in Spain and takes place from 9:30 to 9:50 am. At midday, they take another break for lunch, this time one hour, in two shifts so the work doesn’t have to stop. The workday ends at 6 pm, although there are always some who stay a bit later. To start off the week, every Monday there is a site meeting to coordinate both construction and safety issues. The work site is alive and the scaffolding, ladders and entrances are constantly moving, so it is important to always be well-informed. In organising the work to be done, the groups set priorities and dole out tasks for the week based on the agreed-upon dates, budget and human and material resources available. Currently the main focus of the works is the central towers, with several teams working on each one. There are also other areas in which work is under way at height, like the roofs, the Passion cyma and restoring the pinnacles. The other main site of work under way is at ground level, including the new flooring on the temple ground. One of the things that can have the biggest impact on the pace of the works is the weather. Because the further up the works get, the more its influence is noted. In fact, we might not notice much wind at ground level, but they are much more exposed up high: nothing can stop the wind and it is very strong. This is very dangerous, and is particularly incompatible with working with the crane, which is so important to everything. For example, when you move a large, heavy object, like a panel for the towers, the wind can twist it and push it back and forth. This means, when it is put back down by the workers who have to correct its orientation and position, the inertia of a pendulum or rotating movement could be deadly. That’s why the cranes must stop work if winds reach 45 km/h. The doubts arise when the wind is just under that level as we’re starting to work, because if there are suddenly gusts half-way through the process it can be very dangerous. So, the temple workers have become true weathermen, looking to the sky because they trust their own instincts more than the often-clashing meteorological reports from mobile apps. 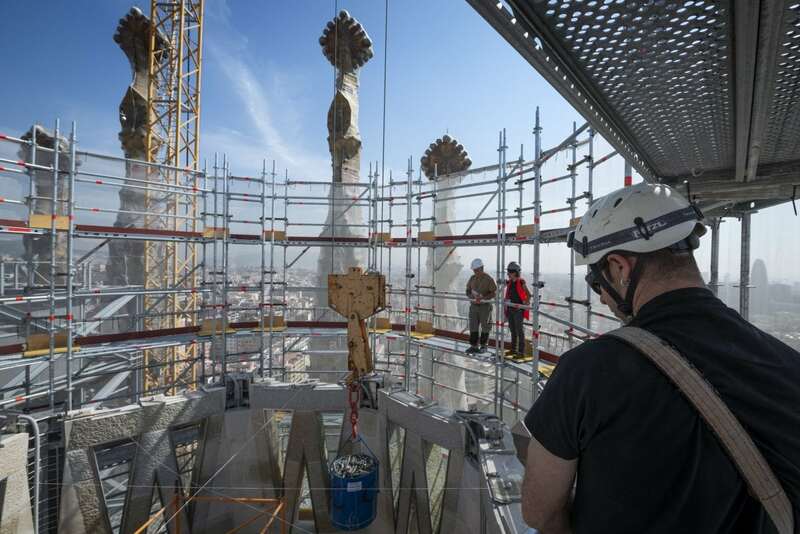 Apart from the wind, the fog, rain or even snow can significantly change the shape of a workday at the Sagrada Família. It can be beautiful to see the sun rise every day from up on high, but the reality is that the climate can be very extreme and has a huge impact on the work done every day: it’s very hot in summer and cold in the winter, even though it would be fun, at least once, to make a snowman with the pinnacles in the background. Before the end of the day, everything must be put back in its place. Tidiness is very important, as an unexpected gust of wind outside of work hours could blow away anything that isn’t tied down or put away. For example, the ropes used by the climbers, who hang from them every day, can’t just be left out. There are locked crates and cupboards and work sheds at different heights. Like tidiness, cleanliness is also necessary and essential. Things must be left clean, like for example the enclosure around the cement mixer, which must be cleaned every time it is used. Otherwise, the cement full of impurities wouldn’t be even close to the quality and strength we are used to having. 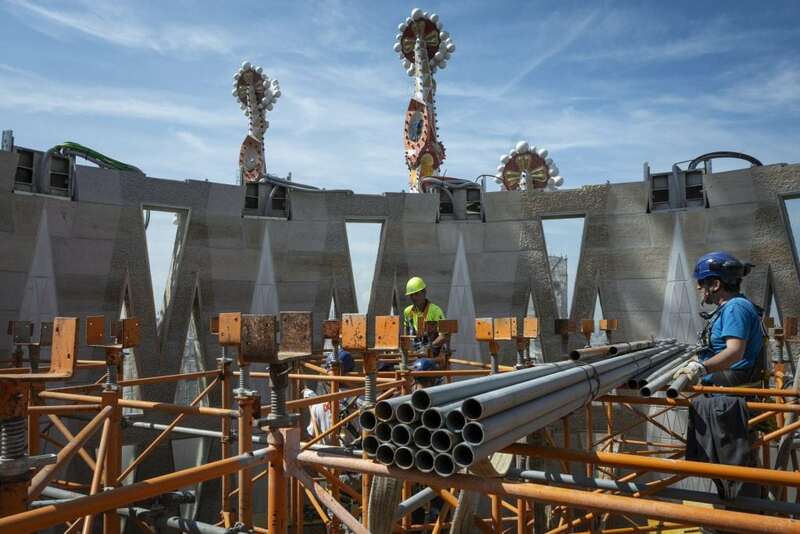 These are the last tasks, but not the least important, of each day on this work site, which isn’t just any site but Gaudí’s masterpiece. When will the cross be put on the Cyma? On this façade, Gaudí designed a pediment crowned with one acroterion at each of the three corners: on either side, the Lion of Judah and the Lamb of Abraham; and in the centre, a cross. The Lion and the Lamb were put in place last December. The cross is still to come and will be put in place soon. We’re preparing a post about the cross for the blog now. Follow us on social media and the blog to get the latest information.